After the limited edition 2001 XKR Silverstone, Jaguar has unveiled the XJR 100 and XKR 100. Both high performance cars, available only in Anthracite Black are named to celebrate the centenary of Jaguar founder Sir William Lyons. Both cars, powered by the same 370 hp supercharged V8 found in standard R models, come equipped with R options including R Performance nine-spoke BBS alloy wheels and cross-drilled Brembo brakes. 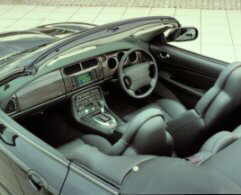 Jaguar’s Computer Active Technology Suspension first introduced on the XKRs will be standard on the XJR 100 saloon as well plus an optional special R Performance Handling Pack for the XKR 100 coupe.The interior features Charcoal leather with a new R option steering wheel and Momo gear knob. The XKR 100 also features additional aluminum trim including sports pedals, gear lever and instrument surrounds and special R performance Recaro leather seats. Both comes with premium sound system, DVD navigation system, rain sensing wipers and reverse park control in addition to the impressive list of standard features. On-the-road prices for the centenary limited edition cars reflect the comprehensive feature specification - £58,935 for the XJR 100, £69,950 for the XKR 100 coupe and £74,950 for the XKR 100 convertible. N.B. The equipment specification and prices quoted in this information relate to the UK market.